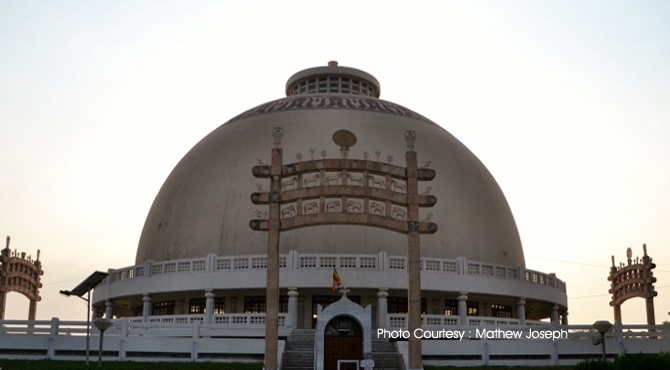 Deekshabhoomi, a sacred monument to Buddhists is situated in Nagpur, Maharashtra. Located in Ramdaspeth, it is here, on October 14th 1956, almost half million of Dalits (outcasts) converted to Buddhism under the leadership of Dr.Baba Saheb Ambedkar, the founder of Indian Constitution. After his death, Dr. Ambedkar Smarak Samiti was organized for the management of Deekshabhoomi. The committee built a Stupa at this place as a memorial to Dr. Ambedkar and a mass conversion of people to Buddhism. The construction started in 1978 and was completed in 2001. The stupa was formally inaugurated and opened for public by Dr. K.R. Narayanan, the then President of India, on 18th December, 2001. Deekhabhoomi literally means 'The land where people accept another religion' ('Deeksha' in Sanskrit means acceptance of religion and 'Bhumi' means Land). Millions of people visit this place every year on Ashok Vijaya Dashmi Day to receive Diksha or pay homage to Dr Babasaheb Ambedkar. The Indian government has started a train in between Gaya and Nagpur due to its growing popularity with local and foreign tourists mainly from the Buddhist countries such as Japan and Thailand. Surrounded by four fountains on all four directions and a huge well-laid garden, the stupa is an architectural admiration. It was designed by famous architect Sheo Dan Mal. Built within an area of 14 acres of Deekshabhoomi, the stupa is the largest hollow stupa amongst all the Buddhist stupas in the world. The stupa is made of marbles which were imported from Dholpur, in Rajasthan. The garden and Deekshabhoomi becomes the venue for various festivals that include Ashok Vijaya Dashmi and exhibitions. Open in large arcs, the doors are decorated with Ashok Chakras and statues of lions, elephants and horses. In front of this stupa, there are statues of Dr. Ambedkar and idols Gautama Buddha. The hall of the stupa in the ground floor, has a 211 x 211 feet large square hall. The hall houses an an idol of Buddha at the center, which was donated by Thai students of Nagpur University. Above the hall, there is a hollow dome surrounded by a veranda. Above the dome, there is a small slab and a decorative umbrella. There is also a library and a photo exhibition of the events in the lives of Gautama Buddha and Dr. Ambedkar. A Buddha Vihara is also situated on the right side of the stupa. In the centre of the vihara, there is a bronze idol of Lord Buddha. There are facilities for the buddhist monks to live. Near to this is the Bodhi Tree a sacred fig tree. It was planted by Bhadant Anand Kausalyayan from three branches of the Bodhi Tree at Anuradhapuram in Srilanka.